And I will be hopping this week! The grand kiddies stayed over and I shall return them tomorrow. They keep me hopping! I found these images in a shoe catalogue and they will make great masks for an art journal! So, I shall be doing some playful hops as the week start, then I shall do some large leaps on my to-do list and I shall end the week with a REAL Blog Hop that Vicki at Field Trips in Fibre has organized for the first three Fridays in December. Check it out. It is not too late to join the Hop which all about real studios as works in progress. 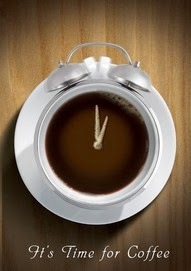 Time to hop to it!!! Oh how I am hopping...in every direction just like you. I just don't seem to be getting much done. Steady the course and onward I shall continue. Check off those items on your list Elle Dear...Your Rooster will be crowing with delight! 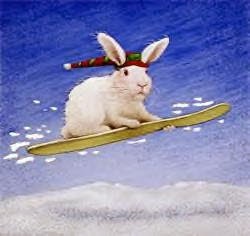 I need that bunny's ski -- maybe a pair -- in this weather! However, given the wind chill, I think I'll just hop down the hall to the Sewdio and get quiltin'! You sound way too "hoppy" about all the projects facing you! You must have decided to take smaller bites out of big projects! I'm anxious to see the completed kitchen.